Last year at the North American Vegetarian Society’s annual “Summerfest” in Johnstown, Pennsylvania, we met Will Tuttle in person. Previously, we had only known him through his excellent “Food for Thought” articles published in VegNews and through our association with Prayer Circle for Animals. Not only did we get to meet him, we got to hear him play his own wonderful piano compositions on the stage of the Pasquerilla Performing Arts Center! Now I want to tell you that his book, The World Peace Diet: Eating for Spiritual Health and Social Harmony, is a “must read” for anyone who is searching for an honest account of what we know deep down inside is the truth. And I say this as a born again believer in the Lord Jesus Christ. Truth is universal and has no boundaries. Anyone, of any faith (or no faith), who reads this book will understand what I mean, if they have what Christians call “a teachable spirit”. In The World Peace Diet, Will Tuttle puts into words what we recognize as the truth, whether we admit it or not. As he brings together the whole picture, I think that you will say, “Yes!” in recognition of this, as I did. What is so simple as eating an apple? And yet, what could be more sacred or profound? Food is our most intimate and telling connection both with the natural order and with our cultural heritage. 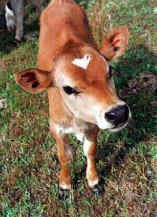 But it is increasingly clear that the choices we make about food today are leading to environmental degradation, enormous human health problems, and unimaginable cruelty toward our fellow creatures. 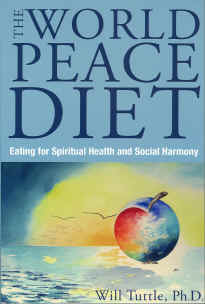 The World Peace Diet presents the outlines of a more empowering understanding of our world, based on comprehending the far-reaching implications of our food choices. Incorporating systems theory, teachings from mythology and religion, and the human sciences, Will Tuttle offers a set of universal principles for all people of conscience, from any religious tradition, that show how we as a species can move our consciousness forward – allowing us to become more free, more intelligent, more loving, and happier in the choices we make. Will Tuttle has a master’s degree in humanities from San Francisco State University and a Ph.D. in the philosophy of education from the University of California, Berkeley. A professional pianist, composer, and teacher, he has for the last fifteen years presented at progressive churches, vegetarian and human potential conferences, and intentional communities throughout the country. He trained in Korea as a Zen Buddhist monk and has worked extensively in Tai Chi, yoga, meditation, intuition development, and spiritual healing. 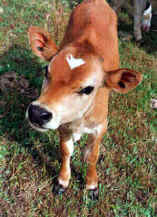 Co-founder of Karuna Music & Art and the Prayer Circle for Animals, he lives in Healdsburg, California.